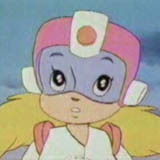 Megagirl is Megaman's female counterpart. She is, like Megaman, quite short, but has a blonde ponytail. Her body, unlike that of Megaman, is pink and white instead of blue and green.